We are all familiar with the understanding of Josef Stalin as a tyrant, a despot, a dictator of the highest degree, whose control of the Soviet Union was absolute. We may also have been familiar with the members of the Politburo, their powers, their extravagances and in some cases, their criminal insanity. Simon Sebag Montefiore’s engrossing novel provides a story within this context, at the very centre of the Politburo and its members, with a stark story of love, politics and family. The novel is one of 3 parts, each of which lead us in a different direction and leads to some unexpected revelations about the characters as the story goes on. The novel begins as a story about Andrei, the child of a ‘lost’ father, who has been in exile with his mother for several years until their sudden return to favour and to Moscow. Unexpectedly accepted to the most prestigious school, School 801, which educates the children of the powerful and the privileged, we follow as Andrei attempts to make sense of this new world and tread the tightrope of loyalty to the party combined with a desire to get to know his new friends. In twists and turns throughout the book, beginning with the catalyst of a tragic shooting of 2 of Andrei’s friends during a festival, we follow the tales of several children and their parents through the highest of the high – dinner with Stalin at his dacha, a dangerous game of bravado, drinking and power games – to the lowest of the low – the Lubianka prison and the misery of the Gulags. Throughout, there are sudden turns in the narrative which make it clear that what you thought about the characters can be wrong – often an austere, Bolshevik surface is opened to reveal simmering passions, fears and a sense of confusion about their place in Russian life. 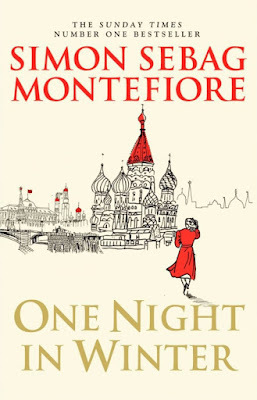 What is most stark about Montefiore’s novel is that we understand the true nature of the Soviet ‘justice’ system, which reveals that when it comes to sniffing out conspiracy, nobody is safe. Some of the most compelling scenes in the novel are interrogation scenes in Lubianka, where the concern of those being questioned is not to tell the truth, but to find something to say which will not incriminate friends or family. There is a sense of terrible, irreparable danger with every step, for every character within this novel. We see all the way to the top, to Stalin himself, and we see rises and falls which, although the main characters in the novel as fictional, mirror what happened in the real world of the Politburo and based on several real life instances which Montefiore references in his fascinating context appendix. For a novel which is centred around the higher echelons of Bolshevism, One Night in Winter is a surprisingly mixed bag of emotions. It is a compelling, well written story, perfect for a winter’s night.